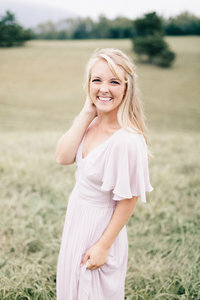 If you saw Emily’s Bridal Session yesterday on the blog, you know just how much I adore this bride. Today, I get to tell you how much I adore both Alex and Emily and their amazing friends and family. Their Hornsby House Wedding was one filled with elegant details, laughter, and enough love to last you a lifetime. Okay, so I cried a total of three times on Alex and Emily’s wedding day. Emily cried too many to count!! (Happy tears, I might add!) I cried during her and Alex’s first look; I cried when Emily and her grandfather were dancing with one another; I cried when I was hugging her goodbye. Just in case you were wondering this doesn’t typically happen for me haha. Alex and Emily shared such a sweet first look, and when Alex turned around and saw Emily for the first time, it was the moment the two of them have been waiting for. He was speechless. In fact, everyone was speechless. I loved the family aspect of their wedding! Emily relationship with her dad is unlike any other. They would steal the dance floor at many different times during the reception with songs that were just their songs. I could tear up just thinking about it. Their love for one another is undeniable. There were so many sweet moments that happened throughout Alex and Emily’s day! Not only did I love so many things about their families, but I also loved Emily’s sweet and beautiful bridesmaids and Alex’s outgoing and thoughtful groomsmen! They were hilarious! Their love and energy and excitement for Alex and Emily on their wedding day was contagious!! Fun bridal parties make the entire day fun!! Oh, and their were two married couples in the wedding party, so to say they were all close is an understatement! From start to finish, Alex and Emily’s wedding day was a dream. From getting ready with the girls (forcing earrings into Emily’s ears…) to their first look to the emotional vows to the dancing on the dance floor (seriously some of my favorite reception photos to date), it was a day I will never forget. Thank you so much Alex and Emily for asking me to be your wedding photographer. I hope you both know how much you truly mean to me!! Enjoy a few of my favorite images from their Hornsby House Wedding!